the body of Barney Stinson? It’s not often an actor has a chance to successfully re-invent himself. There are some examples such as Buddy Ebsen going from Jed Clampett to Barnaby Jones, Raymond Burr from Perry Mason to Ironside, even Lee Majors from Steve Austin (The Six Million Dollar Man) to Colt Seavers (The Fall Guy), and even Tom Selleck from Thomas Magnum to Frank Reagan (Blue Bloods). Perhaps the most striking example is Neil Patrick Harris. Once known exclusively as Doogie Howser, he will likely go down in history now as Barnie Stinson. That’s an amazing feat for an actor who could easily have been typecast the rest of his life as a genius, teenage doctor. 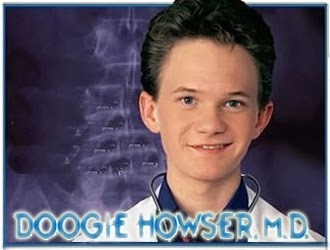 Doogie Howser, M.D. debuted in 1989 with an unlikely premise: a boy genius becomes a doctor. On the surface, the premise seemed goofy bordering on ludicrous. However, it was created by Steven Bochco who was one of the best writers on television. He had already won critical acclaim for shows such as "Hillstreet Blues" and "L.A. Law", so his name lent credibility to the show. Yet, I did not start watching until the summer of 1991. I was home from university for the summer and had no one really to hang out with. Consequently, I spent every night watching reruns of shows I had no time to watch during the school year. That’s when I decided to give "Doogie Howser, M.D." a shot – and I was not disappointed. The show was classic Bochco in a couple ways. He had a stable of actors and drew from that for every one of his productions. In this case, James B. Sikking, who had played Howard Hunter in "Hillstreet Blues", played Doogie’s father David Howser (just as Dennis Franz had been in "Hillstreet Blues", "Bay City Blues" and "NYPD Blue", and Jimmy Smits was in "LA Law" and "NYPD Blue"). It also addressed social issues head on such as AIDS, ageism, teenage sexuality, racism, and homophobia. What made the show compelling was Harris’ portrayal of a boy in an adult world who knew on paper exactly what to do, but struggled with the fact he was dealing with human beings. His best friend was his next door neighbour Vinnie Delpino, who was your average teenager. Vinnie kept Doogie grounded, usually by climbing through his bedroom window to visit him. His parents, David, and Katherine (played by Belinda Montgomery) also provided conventional wisdom to an exceptional teenager. And then there was Wanda, Doogie’s girlfriend who kept him grounded only the way a girlfriend can. "Doogie Howser, M.D." ran its score and was cancelled in 1993 after four seasons. I never saw the final episode but heard Doogie left the hospital and headed to Europe. Neil Patrick Harris disappeared from network television for a time. He returned in 1999, co-starring for a season with Tony Shalhoub in "Stark Raving Mad". Then, in 2005, he assumed the role of Barney Stinson in "How I Met Your Mother". It has been on the air twice as long as "Doogie Howser, M.D. ", spanning more than 200 episodes, and garnered Harris four Emmy nominations, from 2007 to 2010, for outstanding supporting actor in a comedy series. He will go down on history as Barney Stinson. Neil Patrick Harris has definitely left Doogie Howser behind.